In support of Northlake’s vision and the long range goals our congregation developed, the Membership Committee seeks to create a welcoming environment where members and friends can find their place in our beloved community, participate as they are led in the workings of the church and in support of the activities and causes important to them, and give and receive love and encouragement as they walk on their spiritual journey. We welcome your participation in the work of our committee! If you are interested in becoming more involved at Northlake, the Membership Committee is a great way to get to know people and to get plugged into the life of the church. 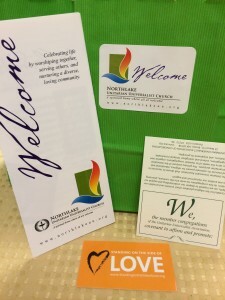 From Sunday morning greeting to welcoming new members to hosting all–church events, this committee has a lot of ways to participate. Long–time member or newcomer, your input is very valuable! We especially encourage newer members and friends to join us, as you bring a unique, fresh perspective to the conversation! Co-Chairs: Cyndy J. and Pat T.
Members: Sue B., Kate C., Diane F., Bob G., Greg S. Shirley P, and Betsy Z. Meeting Time/Location: Second Tuesday of each month at 7:00 p.m. in the Conference Room.